"For me, funding research for Parkinson's not only helps my local community, but also the world," says Dr. Nicole Jarvis in a recent interview for her hometown newspaper, the Norman Transcript. Tonight, Nicole will receive the Sam Matthews Social Justice Award from the Xenia Institute for Social Justice for the incredible impact of her work to help speed a cure for Parkinson's disease (PD). After being diagnosed with Parkinson's in 2011, Nicole, a physician in Norman, Oklahoma and mother of twin boys, connected with The Michael J. Fox Foundation (MJFF). She joined Team Fox to host the inaugural Winter Gala in 2012, raising $100,000 the first year. 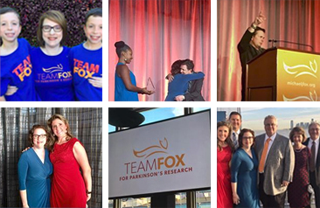 In 2013, she founded the Nicole Jarvis M.D., Parkinson's Research Foundation, which has since generated $1.6 million for Team Fox and donated more than $130,000 to the local Parkinson's Foundation of Oklahoma. In addition to her significant fundraising contributions, Nicole is an active member of MJFF's Patient Council and an advocate for clinical trial participation. Nicole's commitment to helping herself and others live well with Parkinson's is inspiring. She says, "I've never been a person of inaction." Subscribe to our mailing list to receive updates in your inbox.